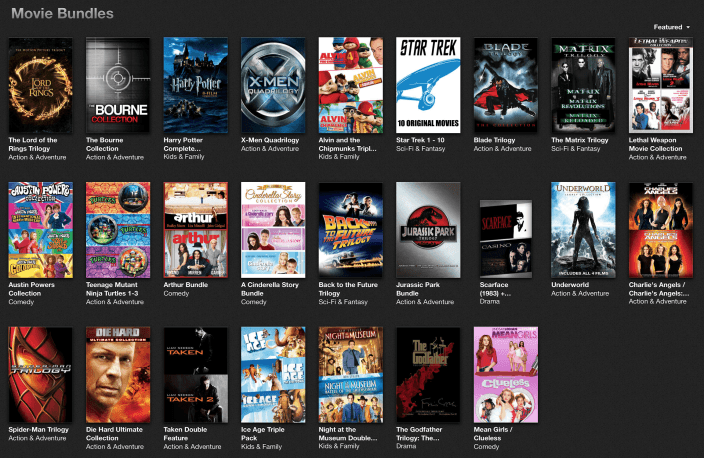 Apple is currently running a promo on movie bundles in the iTunes Store, with some of the best prices we have seen on several popular franchises. There is everything from the Coppola Restored Godfather and Jurrassic Park trilogies to the Ultimate Die Hard Collection. Starting at $9.99, the bundles are available in both SD and HD (US Only). You can grab all 10 of the original Star Trek movies for $19.99. Some of the other more notable deals include the LOTR Trilogy for $17.99 and the The Matrix Trilogy for $9.99, along with the X-Men Quadrilogy for $29.99 in HD. There appears to be some discrepancies with pricing, as some bundles are being removed and then replaced with new prices. The Harry Potter Complete Collection, which comes with all 8 films, was originally listed at $9.99 but was then mysteriously bumped up to $59.99. The above mentioned LOTR Trilogy was originally listed at $9.99. It is unknown what the cause of these prices changes are, but given some of them are quite significant, it may be that a few bundles were mistakenly marked too low. There is no word yet on when the sale will end at this point, but some have suggested it could end next Tuesday when Apple is scheduled to update its movie selection.